The human foot is distinctive. Our five toes lack claws, we normally present the sole of our foot flat to the ground, and our first and second toes are longer than the smaller ones. In comparison to our fellow primates, our big toes are in line with the long axis of the foot – they don’t stick out to one side. In fact, some would argue that one of the defining characteristics of being part of the human clade is the shape of our foot. So imagine our surprise when we discovered fossil footprints with remarkable, human-like characteristics at Trachilos, Crete, that are 5.7m years old. This research, published in the Proceedings of the Geologist Association, is controversial as it suggests that the earliest human ancestors may have wandered around southern Europe as well as East Africa. The period corresponds to a geological time interval known as the Miocene. The footprints are small tracks made by someone walking upright on two legs – there are 29 of them in total. They range in size from 94 mm to 223 mm, and have a shape and form very similar to human tracks. Non-human ape footprints look very different; the foot is shaped more like a human hand, with the big toe attached low on the side of the sole and sticking out sideways. The footprints were dated using a combination of fossilised marine microorganisms called foraminifera and the character of the local sedimentary rocks. Foraminifera evolve very rapidly and marine sedimentary rocks can be dated quite precisely on the basis of the foraminifera they contain. These indicated an age somewhere in the span 8.5 to 3.5 million years. However, at the very end of the Miocene, about 5.6 million years ago, an extraordinary thing happened: the entire Mediterranean sea dried out for some time. This event left a clear signature in the sediments of the surrounding areas. The sediments that contain the footprints suggest they probably date to the period immediately before this, at about 5.7m years. The “cradle of humanity” has long been thought to lie in Africa, with most researchers suggesting that Ethiopia was where the human lineage originated. The earliest known body fossils that are accepted as hominins (members of the human lineage) by most researchers are Sahelanthropus tchadensis from Chad (about 7 million years old), Orrorin tugenensis from Kenya (about 6 million years old) and Ardipithecus kadabba from Ethiopia (about 5.8-5.2 million years old). 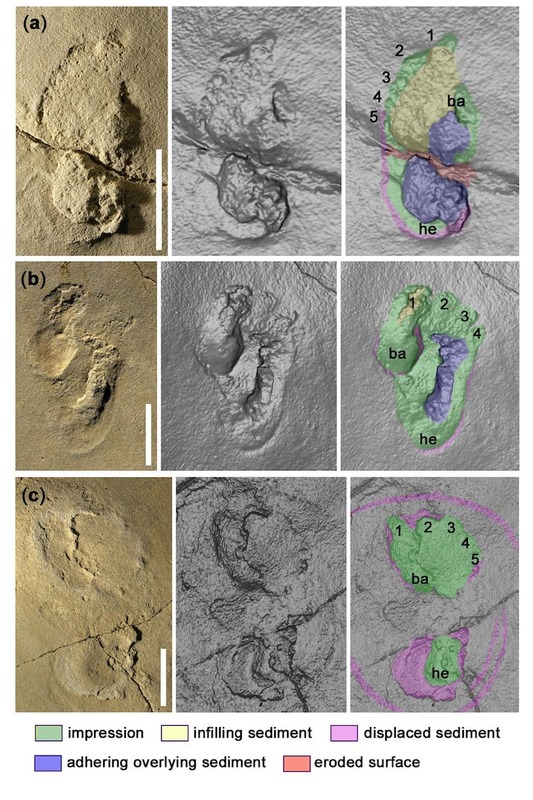 The oldest known footprints, however, were found at Laetoli in Tanzania and come from the next geological time interval, the Pliocene. These are some 3.66 million years old and even more human-like than those of Trachilos. The second oldest tracks are those at Ileret made by Homo erectus (1.5m years old), and are little different from the tracks that we ourselves might make today. If – and for many it is a big if – the tracks of Trachilos were indeed made by an early human ancestor, then the biogeographical range of our early ancestors would increase to encompass the eastern Mediterranean. Crete was not an island at this time but attached to the Greek mainland, and the environment of the Mediterranean region was very different from now. The discovery comes just months after another study reported the discovery of 7 million-year-old Greek and Bulgarian fossil teeth from a hominin ape dubbed “El Graeco”. This is the oldest fossil of a human-like ape, which has led some to suggest that humans started to evolve in Europe hundreds of thousands of years before they started to evolve in Africa. But many scientists have remained sceptical about this claim – as are we. The presence of Miocene hominids in Europe and Africa simply shows that both continents are possible “homelands” for the group. In theory, El Graeco could be responsible for the Trachilos foorprints but without any limb or foot bones it is impossible to tell. But there are other ways to interpret the findings. Some might suggest that the distinctive anatomy of a human-like foot could have evolved more than once. The tracks could have been made by a hitherto unknown Miocene primate that had a foot anatomy and locomotive style not unlike our own. There are examples throughout the fossil record of what is called “convergent evolution” – two unrelated animals developing similar anatomical features as adaptations to a particular lifestyle. However, there is nothing about the Trachilos footprints themselves that suggests such convergence. Convergence rarely produces perfect duplicates; rather, you tend to get an odd mix of similarities and differences, like you see when you compare a shark and a dolphin for example. Now, imagine if the Trachilos footprints combined human-like characters with a few other characters that simply didn’t “fit”: for example, that the toes looked human-like but carried big claws. For those unable to see beyond Africa as the “human cradle”, these tracks present a considerable challenge, and it has not been easy to get the discovery published. Some have even questioned whether the observed features are footprints at all. However, collectively, the researchers behind this study have published over 400 papers on tracks, so we are pretty confidence we know what they are. Although the results are controversial, suggesting that the rich East African evidence for early hominids may not be telling the whole story, it’s important that we take the findings seriously. The Trachilos tracksite deserves to be protected and the evidence should be debated by scientists. It is now for the researchers in the field to embark on finding more tracks or, better still, body fossils that will help us to better understand this interesting period of primate diversity, which ultimately led to our own evolution irrespective of where this first happened. The very essence of this type of science is prospection, discovery, evidence-based inference and debate. We are sure that this paper will stimulate debate; let us hope that it also stimulates further discoveries. Matthew Robert Bennett, Professor of Environmental and Geographical Sciences, Bournemouth University and Per Ahlberg, Professor of Evolutionary Biology, Uppsala University.